The Indian market is one of the fastest growing markets in the world. The policies of the new government has improved the situation of the market even more. The shares are rising and people are showing trust on the market. The rise in the share market in the past one and a half year and also increased the positive sentiments of the people. These days we are investing in lot of different things. At the same time, people want to increase buying capacity by taking loans. Loans for education has also become a common thing. Since our monthly expenses have increased we also need higher insurance policies to secure our family's future. Keeping so many financial details in mind is a hard task for any individual. 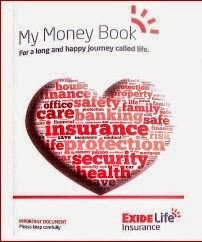 My money book by Exide life Insurance is a book which will decrease your mental tension. Now, you won't have to remember all the financial details, you have one place to keep them all. 1. Reference - The best thing about this book is that you get to keep all your financial details at one place and you no longer have to remember all the details. It will also work as your reference when you would have to quote details about any of your investment or insurance policies. Earlier we had to go through all the documents to get the details now we can get them in seconds as all the information will be there in My Money Book. 2. Organised Record - I like organizing my things. I feel more comfortable if things are sorted and well arranged. It saves me time and mental tension. With My Money Book, I can organize all my financial details at one place which will save me lots of time and mental trouble. 3. Bank details - The book provide separate sections to put all your bank details now you don't have to remember all the details if you use multiple accounts. I think everybody uses more than one account these days. We have different accounts for salary and personal use. If you have trouble remembering details then this will solve it. You can also put your locker and credit card details if you need. Though I won't recommend it as card details should be kept safe. 4. Track your investments - The book gives lots of attention to your investments. You can put details of 4 different Fixed deposits and 8 different mutual funds. It also gives you a investor sentiment that people are more bent towards mutual funds than FD's. You can also track PPF and NPS schemes through this book. 5. Insurance Policies - Insurance policies are the first thing that is mentioned in the book but I have writing about it at the last because most people ignore the need of insurance policies. People will skip the pages and go to their investment details. Hence, I did this on purpose. Now that you know how much you have saved in your bank accounts and how much investments you have made in various funds and FD's then it must be easier for you to calculate your insurance. You invest some amount every month in your funds if you are not there then the funds will become static. Hence, to safeguard your family you should do insurance. It will give them a corpus as well as money to live their daily life. You can do multiple insurance to if you multiple responsibilities in your head like you child's education, their living expenses and saving for their marriage. This will decrease the risk at your life.